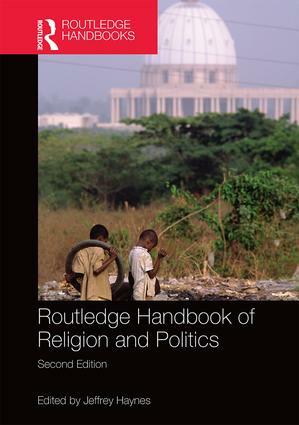 VSB02-001 Routledge Handbook of Religion and Politics. From the United States to the Middle East, Asia and Africa, religion continues to be an important factor in political activity and organisation. The second edition of this successful handbook provides the definitive global survey of the interaction of religion and politics. Featuring contributions from an international team of experts, it examines the political aspects of all the world's major religions, including such crucial contemporary issues as religious fundamentalism, terrorism, the 'war on terror', the 'clash of civilizations', the Arab Spring, and science and religion. Each chapter has been updated to reflect the latest developments and thinking in the field, and new chapters such as ‘Postsecularism and international relations’ and ‘Securitization and Secularization: The two pillars of state regulation of European Islam’ have been added to ensure the book is a comprehensive and up-to-date resource. Four main themes addressed include: •World religions and politics •Religion and governance •Religion and international relations •Religion, security and development References at the end of each chapter have been overhauled to guide the reader towards the most up-to-date information on various topics. This book is an indispensable source of information for students, academics and the wider public interested in the dynamic relationship between politics and religion.